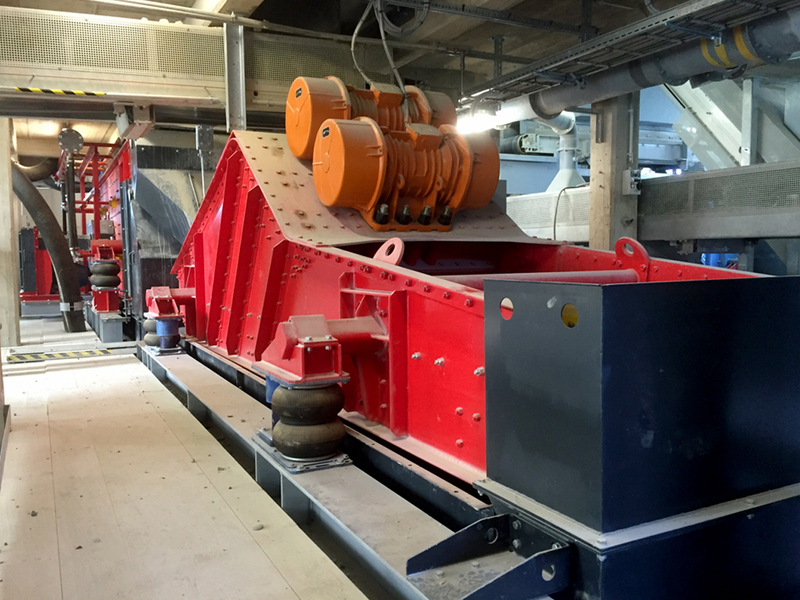 The SIEBTECHNIK linear-motion screening machine is used to screen and dewater grainy bulk goods. Drive is provided by either double unbalance gear units (type HG, HG-E, UHG), dual-shaft drives (type DWS, DZS, HN) or by unbalance motors (type HR, HR-E, MHR). We build linear-motion screening machines with top- or bottom-mounted drive units for extreme requirements. 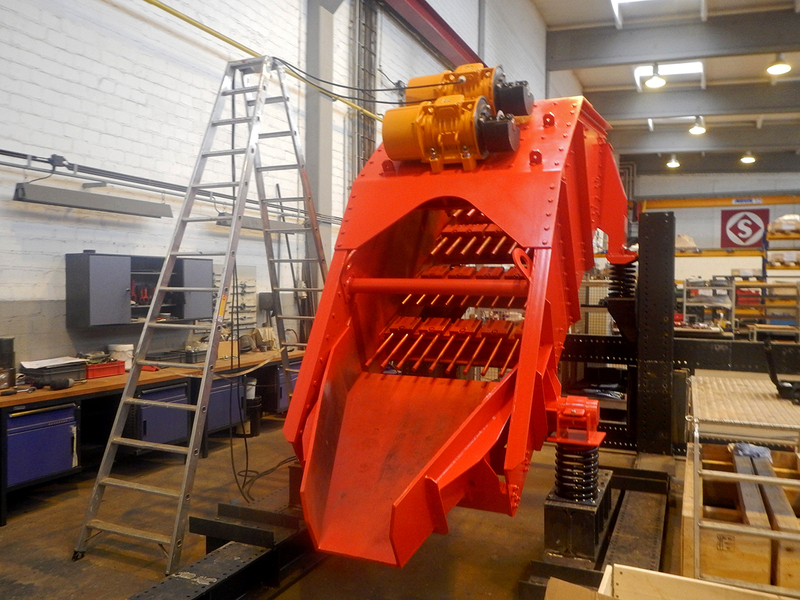 This applies to wide machines (up to 5.5 m wide) or to extremely grainy feed material (e.g. granite with an edge length of approx. 1.2 m). 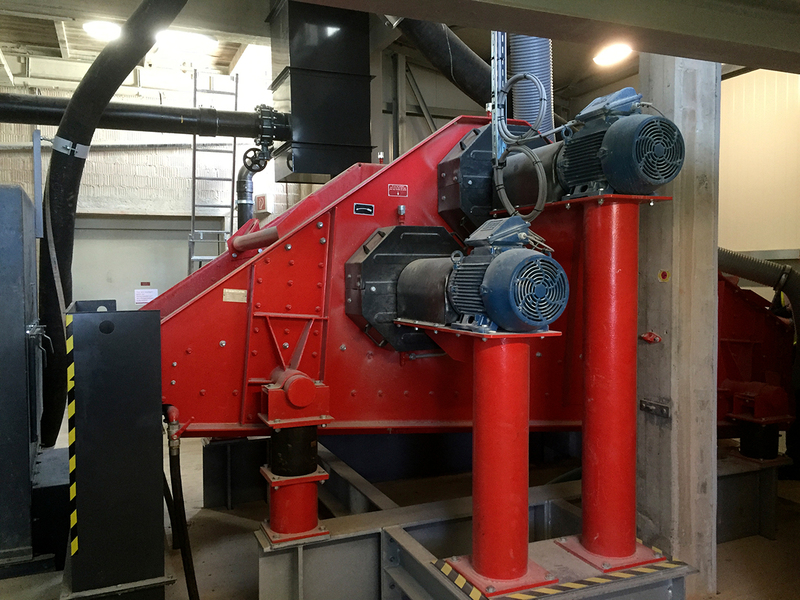 Also high feed material temperatures and the demand for low residual moisture can be met with these machines. 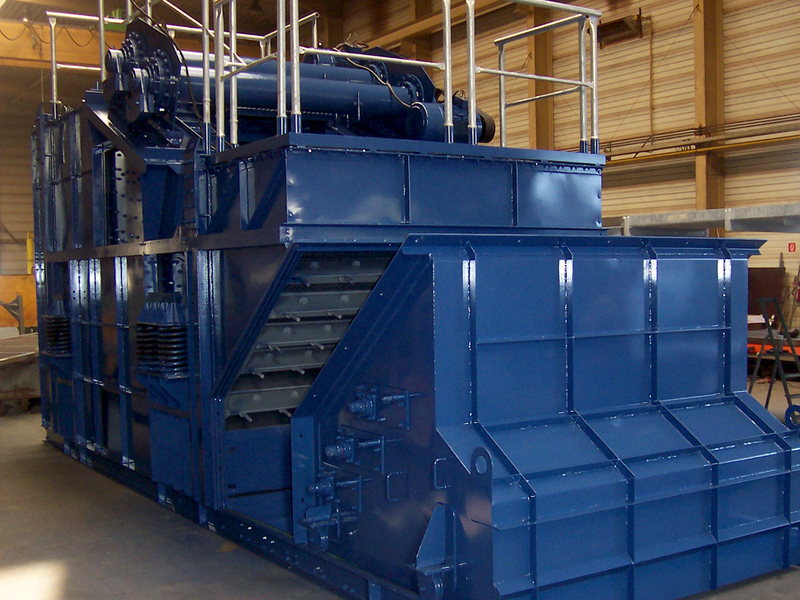 We manufacture geared screens with one or more decks. Different gear unit sizes enable outstanding setting-up for your specific application. The balance masses and speeds can be adjusted in stages. This enables the linear vibration amplitude and acceleration of the gear box to be optimally adapted to suit the technical process requirements. Our SIEBTECHNIK gear units are fast and easy to fit and offer high screening machine availability. We recommend this drive concept for e.g. 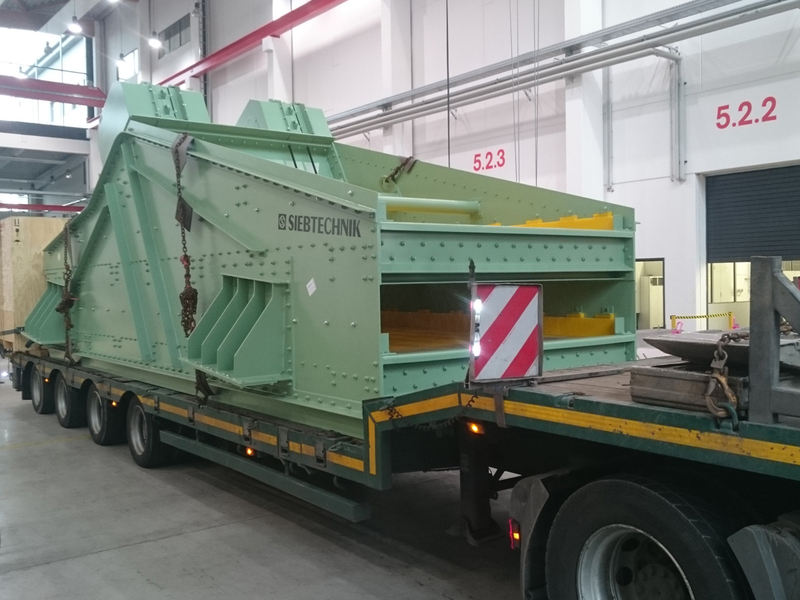 crusher load-relief screening, i.e. as a preliminary screen with high feed rates or coarse separating cut. The drive concept of dual-shaft screens is based on the proven vibration generating system on our circular-motion machines – but in a dual version. Two bearing-mounted drive shafts with unbalance masses are driven in opposite directions. The resulting action of the screen box is thus a linear one, as with geared screens. We recommend this drive concept for e.g. 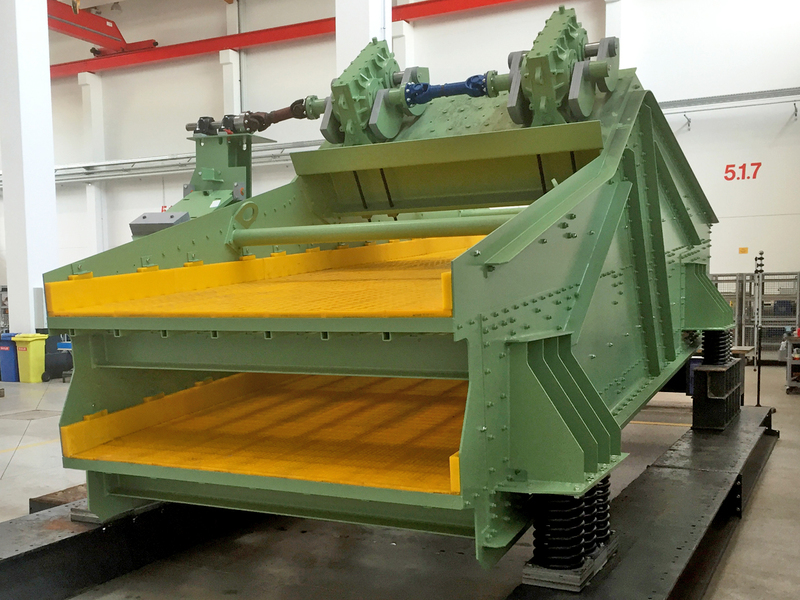 the multi-deck screening of hot stone chip material at temperatures of up to 450 °C during the manufacture of asphalt and low-pressure dewatering of sand. An economical alternative to double unbalance gear units or the dual-shaft solution is a drive provided by two unbalance motors – specifically in the area of small nominal widths. Two unbalance motors are driven in opposite directions. The resulting motion of the screen box is therefore linear – as on the geared screen or the dual-shaft system. These largely smaller linear-motion screens are used for e.g. the dewatering of sand, gravel, ore, borehole flushing and slag or in recycling. SIEBTECHNIK linear-motion screening machines are freely vibrating machines, that is, the vibration amplitude freely adjusts itself to suit the mass ratio of screen box and unbalance mass. 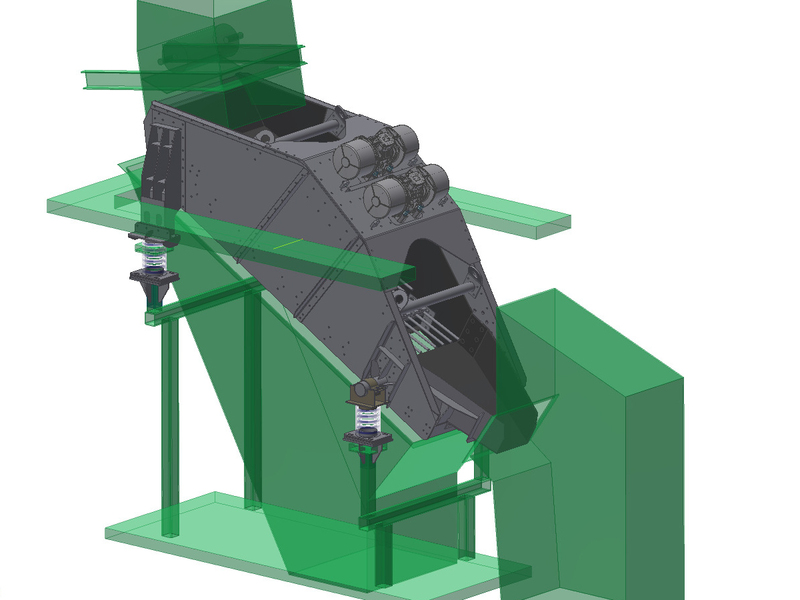 Linear-motion screening machines are designed with a selectable steep (approx. 75°) or shallow (approx. 40°) throw angle and are therefore flexible with regard to the selection of the screen panel tilt, which ranges from upwards through horizontal to downwards. 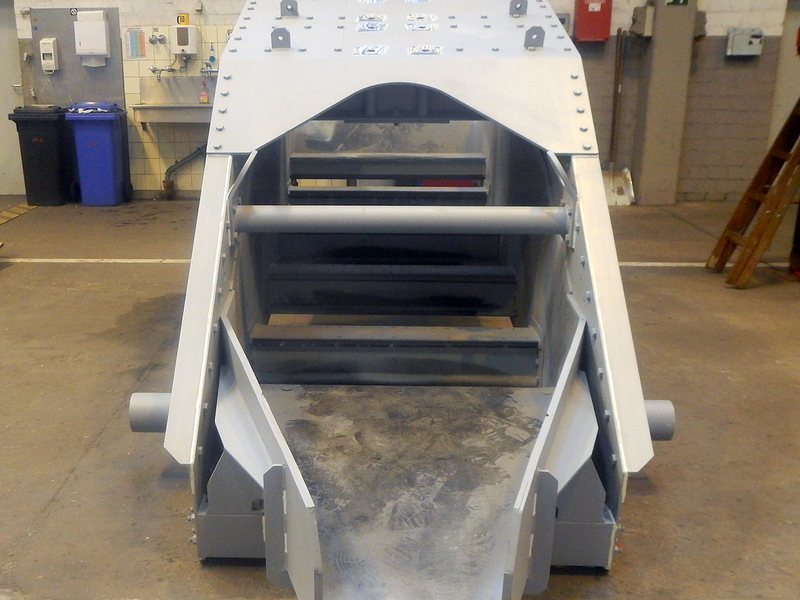 Examples are dewatering screens with an upwards tilt of between 3° and 5° and screening machines for classification that require a downwards tilt of up to approx. 40° (thin-layer screening). 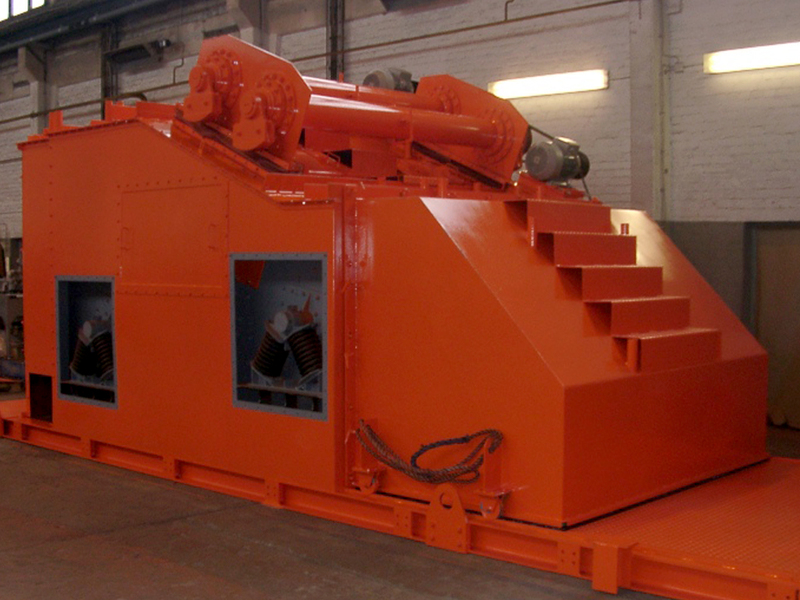 Our HG (double unbalance gear units), DWS (dual-shaft screen) and HR (unbalance motors) series screening machines offer separation sizes of between 0.5 and 300 mm and a screen area of approx. 1 to approx. 60 m². These machines can be set up for a vibration amplitude of between 2 and 14 mm, depending on the product. The screen set-up can comprise between one and three screen decks. Speed and vibration amplitude of the linear-motion screening machine can be varied specifically to suit the product and so ensure a lastingly perfect screening result. The screen box is set up to hold lengthways or crossways tensioned screen panels or for level screen decks and naturally also for system screen cloths by different screen cloth manufacturers. The screen box, consisting of side walls and cross-members, can withstand all static and dynamic forces. 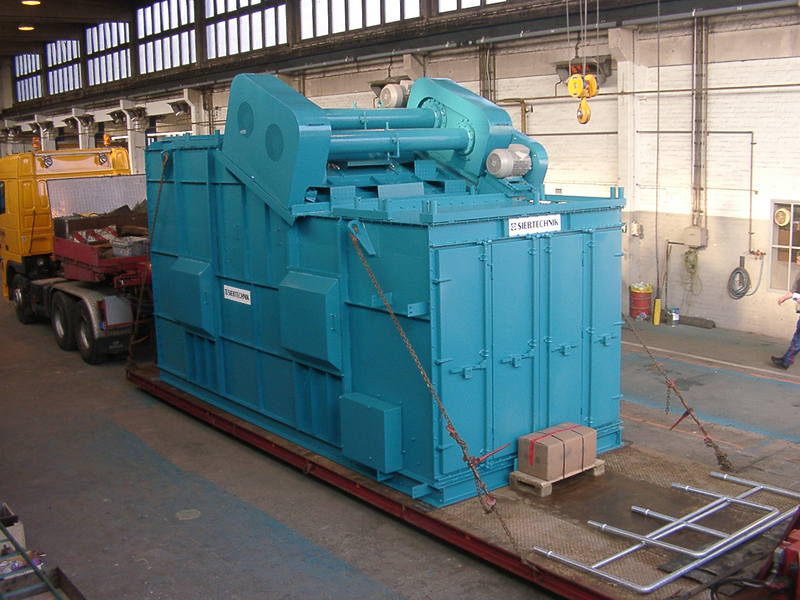 The vibration generating system is not arranged at the centre of gravity of the screen box. Double unbalance gear units or unbalance motors are mounted on a drive bridge. The important thing is that the resulting force direction runs through the centre of gravity. 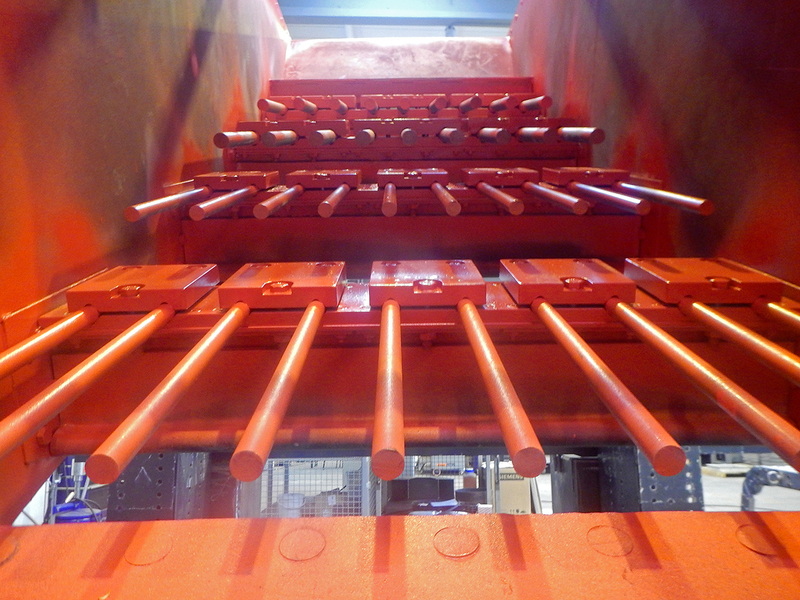 The same applies to the position of the two drive shafts on dual-shaft screening machines. The linear-motion screening machine is driven by V-belt drive with intermediate transmission or by a direct drive with a universal joint shaft. Double unbalance gear units have an oil filling. Unbalance motors are grease-lubricated for life. Double shaft screens are optionally oil- or grease-lubricated. The screen box is elastically supported against the substructure on 4 spring elements. Here different systems of helical compression springs, rubber buffers, vibration elements or air bellows are possible and, if required, combinable (hybrid suspension). For dusty screened material we supply on request linear-motion screening machines with a dust cover or a closed dust protection box. Individually adapted screening aids in the form of beating devices or spraying systems are also available. The robust construction using and combining standard component parts ensures high flexibility and customer-focused solutions, on the one hand, and, on the other, enables the construction of machines with low-maintenance running time and a long service life. We reserve the right for technical changes. To meet especial demand for low residual moisture in e.g. 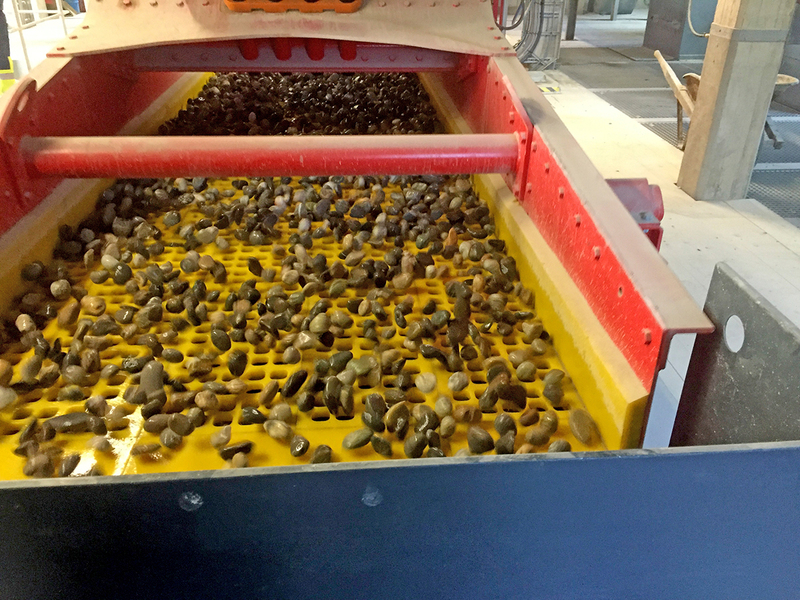 sand, our low-pressure dewatering screening machine is an interesting alternative. It delivers lower residual moisture levels than linear-motion screening machines that are usually used for dewatering. This machine is based on the “dual-shaft screening machine” drive concept, because with this kind of vibration generation higher speeds can be reached. Higher speeds combined with a pneumatic low-pressure system have a marked lowering effect on residual moisture levels. For the manufacture of standard asphalt-bound base and surface layers stationary, semi-mobile or mobile asphalt mixing systems are employed. These consist essentially of a dry drum, bucket conveyor, screening machine, aggregate silos, weighing and mixing equipment and a shipment loading system. 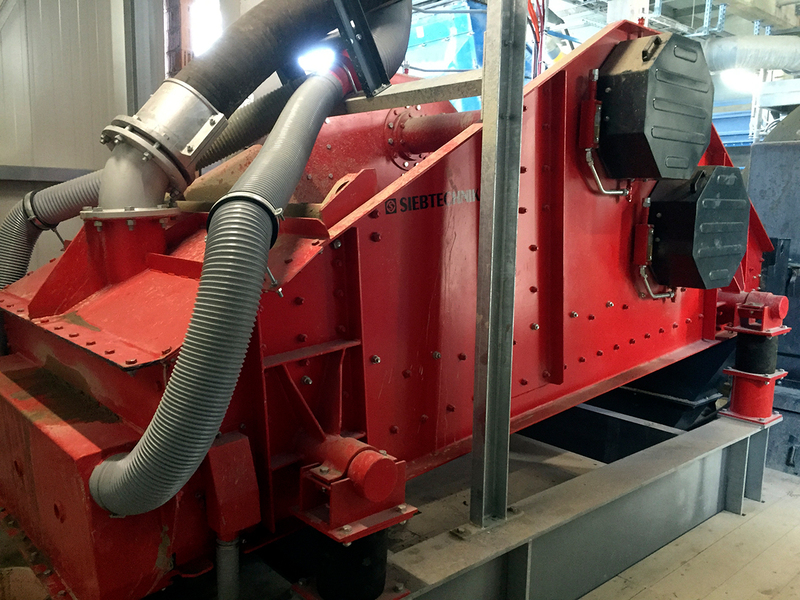 The SIEBTECHNIK type HN screening machine has the advantage that the drive mounting is positioned outside the fixed dust guard enclosure and so outside the heating zone. Hot chippings at temperatures of up to 450 °C have been reliably screened with this system in numerous applications. Here the right choice of screen cloth and the kind of screen cloth tensioning is also important. 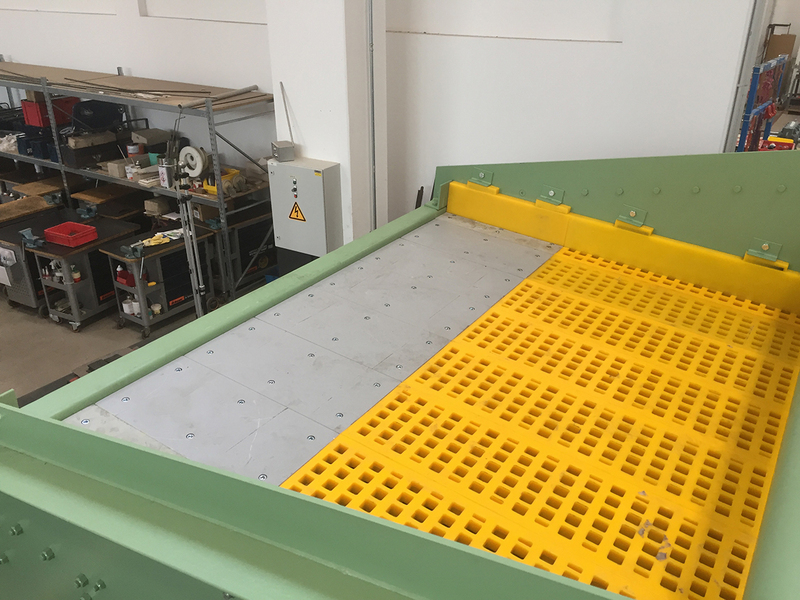 The excellent accessibility of the machines in combination with dust guard covers that enable temperatures to be rapidly lowered are an important requirement for short down-times in cases of maintenance or repair. The dust guard available since 2001 in the new, split version with fully extendable chute carrier brings a further improvement on earlier systems here. 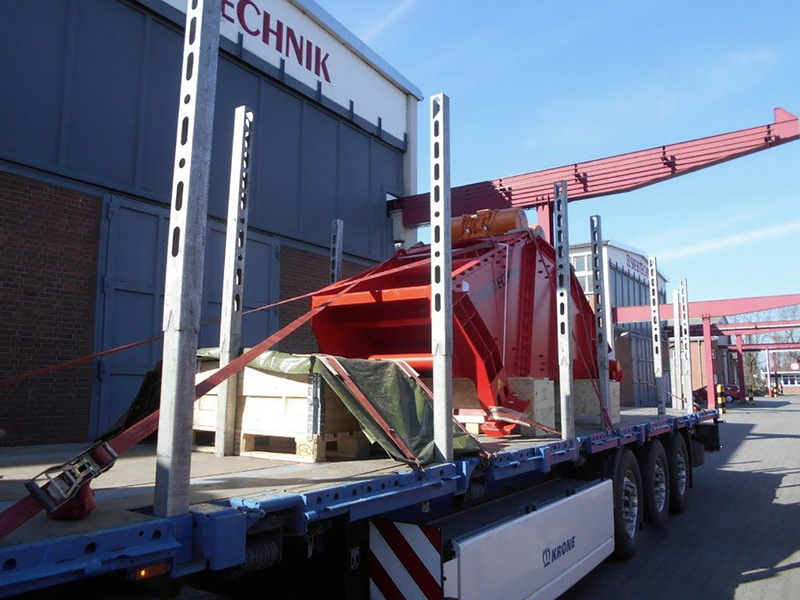 Screening machines for the most varied applications have formed part of our production range for many years. Even if your screening problems seem unsolvable, you should consult us. A well-trained team of engineers and almost 100 years’ industry-specific experience are at your service. Naturally our machines can be perfectly combined and offer the optimum solution as a package.